Frustrated by the challenges of managing her Sunday school class, this volunteer teacher was ready to give up. But participating in the Christian Discipleship Project’s training that mentors young adults to nurture children’s faith gave Johana Mariela the support she needed to continue. Johana was burned out and discouraged. 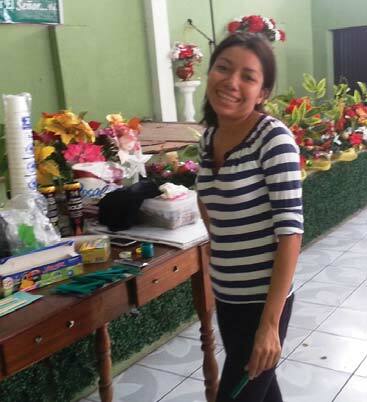 After four years as a Sunday school teacher in El Salvador, she felt as though her hard work wasn’t appreciated or respected by the children’s parents. Although she loved the children, she recognized that many came from homes where they were disciplined with harsh beatings. Their behavior at church reflected the turbulence of their home lives. Johana and a teammate participate in the workshop for young adults to learn how to nurture children’s spiritual growth. But Johana felt uncomfortable bringing up these issues. The parents often dismissed her concerns, saying that because she wasn’t a mother herself, she just didn’t know how to handle children. 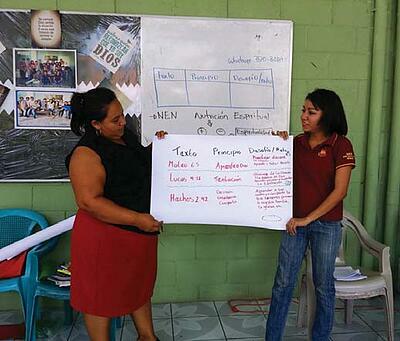 “This makes us to be often discouraged because they do not value what we do,” said Johana. Even the pastor and other church leaders weren’t much help as they focused mostly on the adults of the church, leaving the Sunday school teachers on their own to deal with the children’s classes. But after Johana participated in World Vision’s training for youth leaders, she was filled with new enthusiasm and creativity for teaching her class. Johana was especially influenced by the training’s emphasis on the important role teachers have in walking alongside and guiding the children as they come to know Jesus more deeply. She also had the opportunity to voice her concerns and gain new techniques for managing her class with love. With the new ideas and skills she’s learned, Johana no longer is discouraged and ready to give up her Sunday school teaching.